The Royal Photographic Society’s latest Special Interest Group, the ‘Landscape Group’, launches in January 2016, with RPS members being able to join the group from 5th January. The group’s constitution defines landscape photography as “the photographing of all elements of the land, mountains, hills, farmland, the coast, bodies of water, whether man-made (or influenced) or not, under varying lighting and weather conditions, in both traditional and abstract forms” . Encompassing modern techniques such as intentional camera movement and multiple exposure as well as the more customary landscape forms, the group welcomes all photographers who have an interest in, or a passion for landscape, from the raw beginner to the Charlie Waite’s amongst us. A programme of events is currently in development, which will include photographic trips, workshops, exhibitions and presentations, with the aim of encouraging and improving group member’s landscape photography skills and experience. 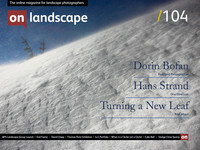 You can contact the group by e-mail on landscape@rps.org. To join: you can e-mail the RPS on membership@rps.org or call them on +44 (0)1225 325 743. The annual subscription is £15.00, in addition to the standard RPS membership subscription. If you are joining the RPS in order to join the group, you can join one special interest group free of charge for one year.